A call for action at Federal Buildings and FBI Offices. We denounce the Federal Bureau of Investigation harassment of anti-war and solidarity activists. The FBI raided seven houses and an office in Chicago and Minneapolis on Friday, September 24, 2010. The FBI handed subpoenas to testify before a federal grand jury to eleven activists in Illinois, Minnesota, and Michigan. The FBI also attempted to intimidate activists in California and North Carolina. This suppression of civil rights is aimed at those who dedicate their time and energy to supporting the struggles of the Palestinian and Colombian peoples against U.S. funded occupation and war. The FBI has indicated that the grand jury is investigating the activists for possible material support of terrorism charges. The activists involved have done nothing wrong and are refusing to be pulled into conversations with the FBI about their political views or organizing against war and occupation. The activists are involved with many groups, including: the Twin Cities Anti-War Committee, the Palestine Solidarity Group, the Colombia Action Network, Students for a Democratic Society, and Freedom Road Socialist Organization. These activists came together with many others to organize the 2008 anti-war marches on the Republican National Convention in St. Paul. We ask people of conscience to join us in fighting this political repression, as we continue working to build the movements against US war and occupation. Call the U.S. Attorney General Eric Holder at 202-353-1555 or write an email to: AskDOJ@usdoj.gov. **Stop the repression against anti-war and international solidarity activists. **Immediately return all confiscated materials: computers, cell phones, papers, documents, etc. **End the grand jury proceedings against anti-war activists. Plan and Support national days of protest at FBI offices or Federal Buildings, September 27 and 28th. A demonstration has been called at the Minneapolis FBI Office Monday, 4:30, September 27th(111 Washington Ave. S.). 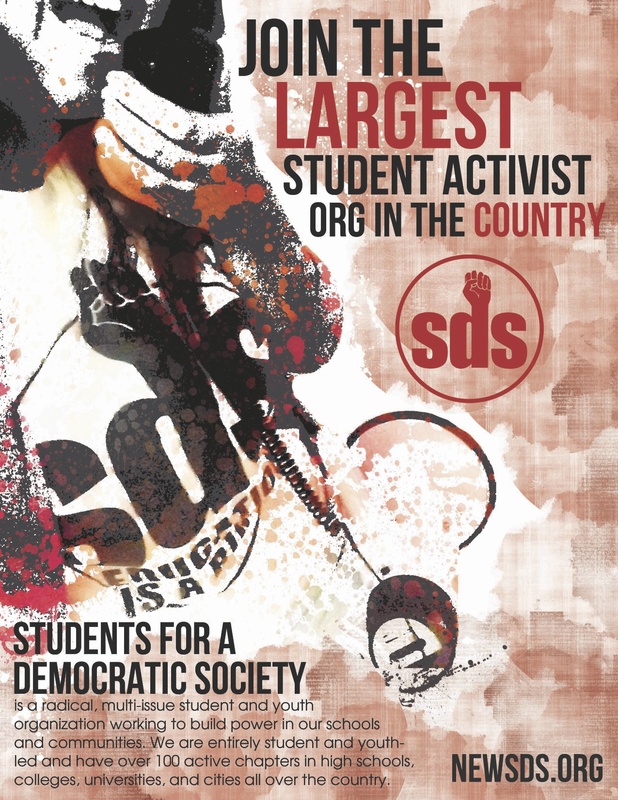 Students for a Democratic Society (SDS) stand in solidarity with their brothers and sisters across the country in the face of FBI repression of progressive causes. SDSers, along with members of the Palestine Solidarity Group, the Twin-Cities Anti-War Committee, the Colombia Action Network, the Freedom Road Socialist Organization, and the National Committee to Free Ricardo Palmera had their homes searched and documents and electronic devices seized. Grace Kelley, an SDSer from the University of Minnesota, said “SDS at the U of M condemns the terror tactics used by the FBI to silence activists who organize against wars and for peace here in Minneapolis as well as across the nation. Tracy Molm from SDS at U of M was one of the activists whose house was raided. SDSers across the country need to stand up and condemn these raids and say that we will not be scared into silence, that we will continue to stand up and fight for what’s right”. Several activists in Minnesota and Chicago have had papers, CDs, and cell phones stolen among other items; as well as being issued subpoenas to appear before a federal grand jury. The FBI are apparently looking for evidence linking activists to “material support of terrorism” specifically liberation struggles in Colombia and Palestine. In addition to SDSers being harassed in Minneapolis, two SDSers in Milwaukee were also contacted by the FBI about their anti-war activism. The activists involved have done nothing wrong and are refusing to be pulled into conversations with the FBI about their political views or organizing against war and occupation. No arrests have been made – make no mistake, this is a fishing expedition by the FBI. We urge all progressive activists to show solidarity with those individuals targeted by the U.S. Government. Activists have the right not to speak with the FBI and are encouraged to politely refuse – just say “No”. Show your support! Organize solidarity actions in your city demanding that the FBI halt all searches and seizures against progressive activists who have done nothing wrong. Contact your local media and let them know that we will not tolerate this kind of harassment from the government. And be aware – if the FBI knocks, you do not have to give out any information or answer any questions.